My sister-in-law warned me: flies are hard. It was extra hard because the line in the Burda 7841 detailing how to attach the underside zipper made no sense. Like really, it was in the English column, but it wasn't the English that I speak. These are for a Gaius Baltar cosplay, in case you're just tuning in. Apart from the puckering around the fly, which is not too obvious when attached to a person, the pattern was great. The fit is nice and slim, the pieces fit together in a simple and obvious way, and the pockets are nice and roomy. I skipped the back pockets because they didn't seem necessary for this suit, and they looked a bit complicated. 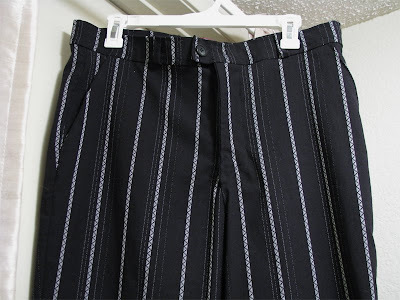 I picked this pattern because it was literally the only pattern for a simple pair of men's pants in all of Joann Fabrics, but I've heard good things about Kwik Sew 3267 if your store has that brand in stock and you want some better fly instructions than Burda has to offer. The fabric is from Fabric.com's sale section and was only $2 a yard. It's a stretchy suiting. 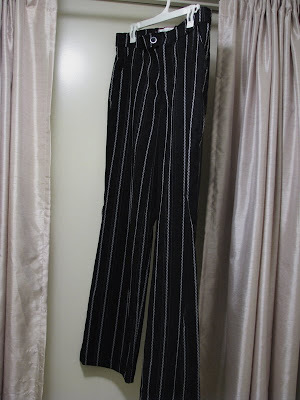 Geoff was unavailable to model these pants, so they are being modeled by the curtain rod over my bedroom door. Yes, my bedroom has curtains. There is a reason, and it has to do with cats. It gives my bedroom a Turkish harem feel, I think.